The Tibetan Plateau (TP) has become a focus of strong scientific interest due to its role in the global water cycle and its reaction to climate change. Regional flux estimates of sensible and latent heat are important variables for linking the energy and hydrological cycles at the TP’s surface. Within this framework, a 3-year dataset (2008–2010) of eddy covariance measured turbulent fluxes was compiled from four stations on the TP into a standardised workflow: corrections and quality tests were applied using an internationally comparable software package. Second, the energy balance closure (C EB) was determined and two different closure corrections applied. The four stations (Qomolangma, Linzhi, NamCo and Nagqu) represent different locations and typical land surface types on the TP (high altitude alpine steppe with sparse vegetation, a densely vegetated alpine meadow, and bare soil/gravel, respectively). We show that the C EB differs between each surface and undergoes seasonal changes. Typical differences in the turbulent energy fluxes occur between the stations at Qomolangma, Linzhi and NamCo, while Nagqu is quite similar to NamCo. Specific investigation of the pre-monsoon, the Tibetan Plateau summer monsoon, post-monsoon and winter periods within the annual cycle reinforces these findings. The energy flux of the four sites is clearly influenced by the Tibetan Plateau monsoon. In the pre-monsoon period, sensible heat flux is the major energy source delivering heat to the atmosphere, whereas latent heat flux is greater than sensible heat flux during the monsoon season. Other factors affecting surface energy flux are topography and location. Land cover type also affects surface energy flux. The energy balance residuum indicates a typically observed overall non-closure in winter, while closure (or ‘turbulent over-closure’) is achieved during the Tibetan Plateau summer monsoon at the Nagqu site. The latter seems to depend on ground heat flux, which is higher in the wet season, related not only to a larger radiation input but also to a thermal decoupling of dry soils. Heterogeneous landscape modelling using a MODIS product is introduced to explain energy non-closure. Exchanges in heat energy, momentum and mass are key variables for land surface processes affected by atmospheric circulation and climate, and provide feedback for atmospheric dynamics and climate change. The TP is the world’s largest alpine ecosystem, with an average altitude of >4,000 m a.s.l. across 25° of longitude. Because of its effect on the regional, and global, energy and water cycles, the TP has been the subject of climate study since the mid-twentieth century (Yeh et al. 1957; Flohn 1957). A series of atmospheric science expeditions have been carried out on the TP (e.g. the ‘First Tibetan Plateau Meteorological Science Experiment, 1979’, ‘Tibetan Plateau Surface Heat Resource Observations’ (Ji et al. 1986), the ‘Second Tibetan Plateau Meteorological Science Experiment (TIPEX)’ (Xu et al. 2002) and the ‘Coordinated and Enhanced Observation Period (CEOP) of the Asian-Australian Monsoon Project in Tibet (CAMP-Tibet)’ (Wang et al. 1999; Koike et al. 1999; Ma et al. 2005, 2006)). Recently, the Chinese National Key Programme for Developing Basic Sciences and the Third Pole Environment (TPE) reported on its work on the TP and its environs. The dynamic and thermodynamic effects of the TP have been explored using these observational datasets. They show that sensible heat flux transfer dominates the pre-Asian monsoon period, while a latent heat flux prevails during the summer monsoon period, except for the western TP (Chen et al. 1985). Energy imbalance is obvious in the monsoon season (Bian et al. 2002; Yang et al. 2004). Previous studies show that before the onset of the monsoon, the TP is the major energy source providing sensible heat flux to the atmosphere (Li and Yanai 1996). 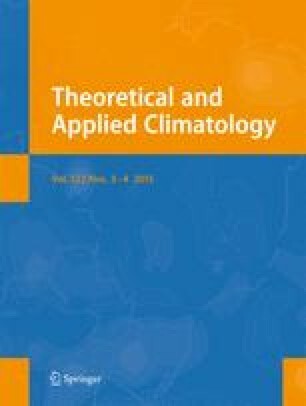 During the rainy season, the latent heat released to the atmosphere is the dominant heat source over the eastern TP, whereas sensible heat flux is comparable to latent heat flux over the western TP (Chen et al. 1985). Over the past 50 years, scientists have paid much attention to this kind of research over the TP. The first Qinghai-Xizang Plateau Meteorological Experiment in 1979 obtained some important results: during the dry period, sensible heat flux is the major energy source delivering heat to the atmosphere, whereas latent heat flux is greater than sensible heat flux during the wet period (Zhang et al. 1988). In summer, the plateau surface is a heat source, and in the dry period, sensible heat flux is the major heat source; during the rainy season, the latent heat flux becomes as important as the sensible heat flux (Qian and Jiao 1997). Several studies of turbulent energy flux have been conducted on the TP. For instance, Yeh and Gao (1979) obtained a vertically integrated mean heat source of 138 W/m−2 over the western TP in June, whereas Chen et al. (1985) estimated it as 37 W/m−2. This large discrepancy was caused by the different drag coefficients used in the bulk method, resulting in the sensible heat fluxes differing by a factor of 2–3. Li et al. (2001) reported a wide range of drag coefficients (i.e. 2.5 × 10−3 to 12 × 10−3) over the TP despite using the same data. Latent heat flux vis-à-vis residual surface energy can be estimated as a budget. However, this approach is prone to error because of the significant imbalance in the energy budget on the TP (10–40 %) which has been reported (Kim et a1. 2001; Bian et al. 2002). A network of atmospheric boundary layer and turbulence flux measurement stations was set up in 1998 at the beginning of the GEWEX Asia Monsoon Experiment in Tibet (GAME-Tibet, 1996–2000) and the CEOP of CAMP-Tibet to make long-term, and continually improved, observations. Although many studies have explored the characteristics of turbulent fluxes over the TP using these observational data (Ma et al. 2003; Tanaka et al. 2003; Gu et al. 2005; Liu et al. 2009; Yao et al. 2011; Bian et al. 2012; Zhang et al. 2013), uncertainties within these approaches remain substantive. The eddy covariance (EC) method can be applied to reduce these uncertainties. Shi and Liang suggest that land-biosphere-atmosphere interactions may regulate the temporal variation of the surface-sensible and latent heat fluxes, although the magnitude of such couplings has seasonal dependence (Shi and Liang 2014). However, they do not provide a detailed analysis. This study will focus on establishing a consistent framework for turbulent flux analysis, quality assessment, C EB and landscape heterogeneity, and analyse differences/characteristics in the observations at different places on the TP. Section 3 introduces the turbulence data and quality assessment, while Section 4 focuses on C EB, prior to our conclusion. Heterogeneity in the TP region exists due to both orography and a patchy land use structure. Measuring sites therefore included locations in the Qomolangma valleys (Qomo) in the southern TP and in the Linzhi valleys (Linz) close to the forested southeastern TP, as well as sites on the banks of NamCo Lake (Namc) and on the Nagqu grasslands (BJ) in the central TP (Table 1 and Fig. 1). Mainly grassland sites (three stations) and gravel fields (one station) were probed. The four stations represent different locations and typical land surface types on the TP (high altitude alpine steppe with sparse vegetation, densely vegetated alpine meadow and bare soil/gravel) (Table 1 and Fig. 1). The EC measuring technique was applied in order to provide high-quality and continuous surface turbulent flux data for momentum and sensible and latent heat. The typical EC measuring set-up consisted of a sonic anemometer (CSAT3, Campbell Scientific, Inc.) and a fast-response hygrometer (LI-7500 open-path gas analyser, Li-COR Biosciences) (Table 1). The EC system at all stations was installed before May 2010 ca. 3 m above ground level, except at the BJ site, where EC equipment was set up 20 m above ground level. The sampling frequency of the EC raw data was 10 Hz. The time zone used was Beijing Standard Time (UTC + 8 h). Additionally, soil and radiation measurements as well as standard surface meteorological data were recorded at all of the sites for 2008–2010. The four radiation components were measured at a height of 1.20 m with CNR1 equipment (Kipp & Zonen, Delft, Netherlands) for all sites except the BJ site, where shortwave net radiation components were measured using a CM21 machine (Kipp & Zonen, Delft, Netherlands), and longwave components with an Eppley PIR device (Eppley Laboratory, Inc.) at a height of 1.40 m above ground level. Subsurface soil heat flux values at 0.05 and 0.10 m depths were measured with a HFP01 heat flux plate (Hukseflux Thermal Sensors) at all sites. Soil temperatures at 0.05, 0.10, 0.20, 0.40, 0.80 and 1.60 m depths were measured using a TR219-L sensor at the BJ site and a PT100 device (Vaisala) at the Qomo, Linz and Namc sites. Soil moisture at 0.05, 0.10, 0.20, 0.40, 0.80 and 1.60 m depths was measured using a CS616-L water content reflectometer (Campbell Scientific, Inc.) at the BJ site and a Theta Probe Soil Moisture Sensor ML2x (Delta-T Devices, Ltd.) at the Qomo, Linz and Namc sites. Precipitation was measured using a Geonor (model T-200B) precipitation weighing gauge (Geonor, Inc.), which allows the measurement of both liquid and solid precipitation. The EC flux dataset of all the turbulence data was processed and quality-controlled using the TK3 software package developed by the Department of Micrometeorology, University of Bayreuth (Mauder and Foken 2011). Following Mauder et al. (2006), the processing steps and flux corrections listed below were applied to the EC raw data. Cross-wind correction of the sonic temperature if necessary (depending on sonic anemometer type). Correction of density fluctuations (WPL correction) to determine fluxes in the scalar quantities of H2O and CO2 (Webb et al. 1980; Fuehrer and Friehe 2002; Liebethal and Foken 2003, 2004). The impact of these processing and flux-correction steps on flux estimates and C EB has been discussed in Mauder et al. (2006). Quality tests implemented using TK3 consist of a stationarity test and a test of the fulfilment of integral turbulence characteristics (ITC) for each turbulent flux (Foken and Wichura 1996; Foken et al. 2004). According to Rebmann et al. (2005), the final quality flag (1–5) is assigned to a specific half-hourly turbulent flux value by combining the quality flags for stationarity and ITC. Classes 1–2 can be used for fundamental research and classes 3–4 for general use such as continuously running systems. Turbulent flux values marked with a class 5 quality flag should be rejected. The heat storage in the upper soil layer is included in the value of Q G and was calculated according to the method of Yang and Wang (2008). Other storage terms (plants, air, etc.) and photosynthesis can be neglected as they are usually very small for low-level vegetation (Foken 2008). Two methods have been applied to correct an unclosed energy balance. One method is to preserve the Bowen ratio (EBC-Bo), as in Twine et al. (2000). This means the residuum is divided up according to the Bowen ratio (Bo = Q H/Q E; Q H, sensible heat; Q E, latent heat) and distributed to sensible and latent heat accordingly. The Bowen ratio after correction is the same as before. The correction is only applied when both sensible and latent heat flux exceed 10 W/m2 (and Bo >0). Details can be found in Charuchittipan et al. (2014). where with the residual Q res, c p is the air heat capacity andλis the heat of evaporation. There is a weak dependency of EBC-HB on air temperature T. For f HB = 1, >90 % of the residual Q res is added to the sensible heat flux, whereas for f HB = 0.1, it is ca. 60 %. As the method does not preserve the Bowen ratio, EBC-HB is calculated iteratively until f HB converges. Similar to EBC-Bo, the correction is only applied when both sensible and latent heat flux exceed 10 W/m2. Ground heat flux measurements were shifted forward 30 min due to soil measurement delays (NamCo only). Exception (a) arose because the land surface features of the Linzhi site are very complex, with river, road, forest, hill, etc. The surface heterogeneity within the footprint area can be seen in Fig. 2. It shows the cumulative flux contributions (isopleths) for 2008 for the Linzhi site’s different land uses. Flux contribution clearly varies with differing land use. The 50 % flux contribution area reached the road in the east and the river in the north and was limited to 100 × 100 m2. This is why we selected the <50 % flux contribution data. Variations in energy fluxes vis-à-vis monsoon exchange were calculated for the Qomolangma, Linzhi, NamCo and Nagqu sites (Fig. 2). Past literature shows that the onset of the summer monsoon on the TP occurs in June, continues through July and August, begins to retreat in September and disappears by mid-October (Xu and Gao 1962). We therefore defined March, April and May (MAM) as pre-monsoon; June, July, August and September (JJAS) as monsoon; October and November (ON) as post-monsoon; and December, January and February (DJF) as winter. Surface energy fluxes in winter are lower than those of other seasons for the four sites, indicating weak heat exchange. In the pre-monsoon period, Q H increases with rising net radiation values, while Q E and Q G remain low. At the Linzhi site, Q H increases slowly in the morning in winter and spring due to the extensive grassland coverage, and Q G registers higher values than other fluxes. As the monsoon approaches, Q E increases and becomes greater than Q H at all sites except Qomolangma. In the winter and pre-monsoon periods, a bell-shaped Rnet curve is visible at all sites, indicating mostly clear and sunny days, with no disturbance from cloud shadow. During the monsoon and post-monsoon periods, the Qomolangma, Linzhi and NamCo sites show decreases in Rnet between 1400 and 1600 hours, and between 1200 and 1400 hours for the Nagqu site; these falls are related to convective clouds. Rnet is higher in the monsoon period than in others due to low albedo at all sites (Table 2 and Fig. 3). As described above, Q E is higher than Q H during the monsoon season, except at the Qomolangma site. The impact of the monsoon on the surface energy flux component at all four sites differs depending on their location. Figure 2 shows daily energy flux curves from 2008 to 2010 averaged according to different seasons and locations. In the winter and pre-monsoon periods, Q H is higher than Q E. The seasonal averaged Q H maximum is between 180 and 200 W/m2 at 1400 hours at the Qomolangma site. As the surface is dry and there is low evaporation, Q E is low at ca. 10 W/m2; Q G is also low, though higher than Q E. A possible reason is the pre-monsoon period’s thermal decoupling of dry soils in response to the dry surface and partial net radiation (Q S). In the monsoon season, Q E and Q G increase to a maximum of 100 W/m2 at midday. The energy flux residuum is nearly 200 W/m2 and higher than that in the pre-monsoon season. The high Q E and Q G values at the Linzhi site are due to the extensive grass cover. Q G values are negative after midday, resulting from the snow or ice cover. During the monsoon season, vapour water and evaporation rates increase. Q E is clearly dominant (above 200 W/m2) and is higher than Q H. At the NamCo site, temporal variations in Q H are the same as at the Qomolangma and Linzhi sites in the pre-monsoon period. However, Q E is higher than Q H during the monsoon season, while Q G increases and reaches 200 W/m2 at noon. The residuum is high in the pre-monsoon period, but low during the monsoon season. Another difference is that net radiation is higher in the monsoon period than in the pre-monsoon period at these sites, resulting from greater albedo in the latter period (Table 2 and Fig. 3). Downwelling shortwave radiation is greater in the pre-monsoon period than other periods due to clear skies and low humidity values, except for the Linzhi site. Albedo values are smaller during the monsoon season than other periods, except at Linzhi, with an almost constant value of 0.18 for every period but winter. Albedo values are higher at Qomolangma than at the other sites, except during the post-monsoon period. The Bowen ratio for the Linzhi site is the smallest of all four sites, with a value of 0.63. This shows that latent heat flux is higher than sensible heat flux due to increase in evaporation in the southeastern TP during the pre-monsoon period. The Bowen ratio is >1 at Qomolangma throughout the year, demonstrating that Q H is always higher than Q E.
The energy flux of the four sites is clearly influenced by the monsoon. In the pre-monsoon period, Q H is higher than the other parameters, with a maximum value of 200 W/m2. Other factors affecting surface energy flux are topography and location. At the Linzhi site in the southeastern TP, Q H is <200 W/m2 in the pre-monsoon period, though Q E increases and exceeds 200 W/m-2 during the monsoon season. The type of land cover also affects surface energy flux. For example, Q E is low at the Qomolangma site even during the monsoon as it is covered by bare soil and gravel; the heat from radiation heats the surface and thus increases surface temperatures, which are converted to Q H, meaning Q H remains high during the monsoon season and exceeds Q E. Conversely, Q G is low in the pre-monsoon period, except at Linzhi, while it increases during the monsoon season. At the Linzhi site, Q G remains low during the monsoon season due to the dense vegetative cover. Some of the Q S is stored in the vegetation and cannot be transferred into the soil. Consideration of the energy balance should therefore include its interception by vegetation. Here, we can typically see that the residuum indicates overall non-closure in the winter (DJF), while closure (or ‘turbulent over-closure’) is achieved in the summer at the Nagqu site, for example. Such a circumstance seems to depend on ground heat flux, which is higher in the wet season, as related to a higher radiation input on the one hand, and a thermal decoupling of dry soils on the other. If the Nagqu case is typical, then the scale mismatch (turbulence measurements over the dryer upwind region (Van der Velde et al. 2012) and soil measurements in the wetter regions) is the main reason for the different closure values for different periods. In this study, the Bowen ratio closure can be used to correct the energy balance of EC measurements at the four sites. This computation assumes that f HB has been correctly measured by the EC system, so that individual values of Q H and Q E can be adjusted to balance Eq. 1. The principle for selecting data for calculating C EB is the same as that for calculating surface energy fluxes. Averaged C EB is 61, 76, 78 and 107 % at Qomolangma, Linzhi, NamCo and Nagqu, respectively. The correlation coefficient is 0.7, 0.73, 0.68 and 0.69 for the four sites, respectively. Regarding the 3-year database, the surface energy balance residuum is 39, 24 and 22 % at Qomolangma, Linzhi and NamCo, respectively. This is comparable with the ranges reported on the TP by Kim et a1. (2001) and Bian et al. (2002) (10–40 % residuum). However, there is a negative residuum of −7 % at the Nagqu station. This finding supports the hypothesis that homogeneous areas such as deserts (homogeneous on larger scales than the footprint scale) close the energy balance better than heterogeneous sites (Heusinkveld et al. 2004; Mauder et al. 2007; Foken et al. 2011). Indeed, Nagqu is the most homogeneous site compared to Qomolangma, NamCo and Linzhi. There are different C EB values for different periods. The surface energy balance residuum during the pre-monsoon and monsoon periods is lower than during the post-monsoon and winter periods at all the sites. C EB values differ with the approach of the season. Higher C EB values occur during the pre-monsoon and monsoon seasons at the four sites (Table 3 and Fig. 4). Qomolangma’s C EB value of 65 % in the pre-monsoon period is the lowest; this was 81 % at Linzhi and NamCo, and >121 % at Nagqu. During the monsoon season, C EB values were 60, 76, 76 and 1.11 % at Qomolangma, Linzhi, NamCo and Nagqu, respectively. During the winter, C EB is the lowest for all sites, at <70 % (energy residuum was >30 %). The lowest C EB value was 45 % at Qomolangma. C EB values are overbalanced at the Nagqu site during the pre-monsoon and monsoon periods. The apparently disparate scatterplot might be related to differences in ground heat flux calculations. The C EB values might therefore be biased by the scale mismatch between EC measurements, soil measurements and radiation measurements, especially at the Nagqu site, where the 20 m height footprint is very large, and the westerly upwind region is dryer (Van der Velde et al. 2012). Soil and radiation properties might therefore be different from the ones measured at the station. Table 3 shows that the C EB is higher during the pre-monsoon and monsoon periods, with a lower mean value (μ) for the enhanced vegetable index (EVI), except at the Qomolangma site. This could explain the high C EB during the pre-monsoon and monsoon periods. It is complicated and problematic using variance (σ 2) to explain C EB. Furthermore, the glacial wind and mountain-valley wind effect (Sun et al. 2007; Li et al. 2012) at Qomolangma have important consequences for the non-closure of the surface energy balance during the daytime. The advection produced by glacial and mountain-valley winds leads to a large residuum at the Qomolangma site. To verify this, diurnal variations in wind direction in 2010 were investigated. Figure 5 shows that glacial winds (northeasterly and southerly wind) prevailed from morning to afternoon during the monsoon season at the Qomolangma site. The residuum increased correspondingly from morning to afternoon. This enhanced residuum may be explained by an intensification of advection caused by glacial wind, since an intense latent cooling of the surface leads to greater advective flux being directed towards the local land cover. As such advective flux is not caught by the EC system, the residuum increases. Following the suggestions of Foken (2008) and Foken et al. (2010), energy transported by advection over a heterogeneous landscape can also be transferred to the energy within large eddies, thus becoming undetectable by the EC system. Q G values exhibit a downward transfer in the early afternoon at the Qomolangma site; the transfer is upward at the other sites (Fig. 2). This leads to an energy balance over-closure in the evening at Qomolangma. Further, land cover at Qomolangma is bare soil/gravel, which facilitates sensible heat flux increasing the thermal coupling soil function. We chose the MODIS product with the highest spatial resolution, the MOD13Q1 product (250 m), for the calculation of the EVI in the 20 × 20 km2 area surrounding the four flux towers analysed here. The EVI was chosen over the normalised difference vegetation index (NDVI) because of the saturated NDVI–leaf area index (LAI) relation for forest canopies (Huete et al. 2002). The EVI was chosen over the LAI to avoid uncertainties in the MODIS/LAI algorithm. Data selection followed Stoy’s method (Stoy et al. 2013). The MODIS plant functional types (PFT) and EVI values for the 20 × 20 km2 area surrounding the TP flux towers are shown in Fig. 6. There is a significant negative relation between C EB and the entropy of the plant functional type (I) in Table 4. The relationship between C EB and I(PFT) at the Qomolangma site did not follow this rule due to the area’s simple land cover. Figure 7 shows that the land cover is most homogeneous at the Nagqu site (Fig. 7d), with low I(PFT) values. The NamCo area has water with negative EVI values (Fig. 7g). A 3-year dataset (2008–2010) of EC-measured turbulent fluxes was compiled from four stations on the TP into a standardised workflow: corrections and quality tests were applied using an internationally comparable software package. The typical features of C EB and the monsoon effect on turbulence fluxes were investigated in this study. First, the energy flux at the abovementioned four sites is clearly influenced by the monsoon. In the pre-monsoon period, the sensible heat flux is the major energy source providing heat to the atmosphere, whereas during the monsoon season, the latent heat flux is greater than the sensible heat flux. Other factors affecting surface energy flux are topography and location. Third, land cover affects surface energy flux. For example, Q E is low at the Qomolangma sites even in the monsoon season as its land cover is bare soil/gravel; the heat from radiation heats the surface and increases surface temperatures, which convert to Q H, meaning Q H remains high, and >Q E, during the monsoon season. The latent heat flux increases during the monsoon season and exceeds the sensible heat flux, except at the Qomolangma site. The glacial wind effect which occurs in the Qomolangma area influences the non-closure of the surface energy balance. Enhanced advective flux values caused by the glacial wind effect not captured by the EC measuring system are assumed to be the reason for the higher energy flux residuum during the daytime, especially during the monsoon season. The energy balance residuum typically indicates overall non-closure in winter (DJF), while a C EB (or ‘turbulent over-closure’) occurs at the Nagqu site during the summer. This circumstance seems to depend on ground heat flux, which is higher in the wet season, as related to a higher radiation input on one hand and a thermal decoupling of dry soils on the other. If the latter is typical, then the scale mismatch (turbulence measurements over the dryer upwind region and soil measurements in the wetter regions) is the main reason for the different C EB values for summer and winter. A turbulent over-closure also exists at Qomolangma in the evenings. This seems to depend on ground heat flux, which exhibits a contrary direction of transference to the other three sites in the early afternoons (Fig. 2) as well as a thermal decoupling of the bare soil surface. Landscape heterogeneity can also partly explain the cause of energy non-closure, but is not the only reason. In general, the relationship between C EB and I(PFT) is negative. The C EB rate increases with the decreasing variance of EVI in the areas around the measuring stations. This research was supported by the National Natural Science Foundation of China (Grant No. 91337212), the Chinese National Key Programme for Developing Basic Sciences (Grant No. 2010CB951703), the China Exchange Project (Grant No. 13CDP007), the European Commission (Call FP7-ENV-2007-1, Grant No. 212921) as part of the CEOP-AEGIS project (http://www.ceop-aegis.org/) coordinated by the University of Strasbourg, and the National Natural Science Foundation of China (Grant Nos. 41175008, 40825015 and 40675012).